We all go through them in certain ways. That one-on-one meeting with your supervisor, the daily stand-up, the family meeting, the heart to heart talks, they all have a purpose. The goal is to make sure that we are "on track", whatever on track might mean at that given moment. On track often means different things to different people. I'm having a bit of that now with my son. He's 19, going to college, working a job, and developing a sense of who he is and what he chooses to do. For me, the check-in's are important. For him, they may be less thrilling, because his idea of "on track", at the moment, differs a little from mine. I need to remind myself of this from time to time; I remember having the same conversations with my dad when I was 19. If I'm not mistaken, many of the topics were very familiar ;). Are you working on what you need to? Are there things you probably should stop doing? Are the things you are thinking about stopping doing actually the things you should stop doing, or are they the things you need to double down on? I could greatly expand this list to talk about my family, friends, initiatives I'm involved with, etc., but for today, it's the Self Check-In I want to focus on. I've been experiencing a rediscovery in regards to fitness and health. Today's technologies give us the ability to have these conversations. As I've said many times, RescueTime helps me know what I actually spend my time online doing. It's great when the feedback is positive. It's frustrating when I realize things I'm doing are, at best, a mild amusement or diversion. At worst, they are a total waste of time. Still, those insights are made with regular check-ins and asking myself "what could I be doing with this time?". Sixteen days ago, I downloaded the "Pacer" app because I wanted to do something about my exercise (specifically, the lack thereof). Pacer gave me a very simple goal; "can I get 10,000 steps in every day?". At first, I started thinking about it spread out through the day. I determined the easiest way to do it was to park my car at home and walk to the train station (which is one and a half miles from my house). When I reach Palo Alto, I get off the train and walk to the office (another half mile), and then repeat the process backwards. This makes it part of my daily routine. If I were to just do that, I would be 80% of the way to my goal (and cover four miles each day). Just milling about at the office would takes care of the rest. As I started making that 10,000 step goal each day, I shifting my thinking to "What about doing it at one shot?" Yeah, that is doable. I need to cover five miles, and take me about an hour and forty minutes (that's just walking at a regular pace, no jogging or running, or deliberately lengthening my stride artificially). Soon, I started considering the goal met when I could do it at one shot, or as early as possible. As I was doing this, I started noticing that there was a daily estimation to the calories I was burning (I don't consider this to be scientifically precise, but as a general rule of thumb, sure, I'll take it). As I was looking at the calories, I started asking myself "Hmmm, what if I were to limit my food intake to what I'd burned?" In other words, if I did a walk and I burned 700 calories (which for sake of reference takes me about two hours of walking or about 7 miles), then I am allowed to eat that amount of food. In other words, can I match the calories I eat to the calories I burn? This approach works for immediate meals. I would not recommend doing this too aggressively, because it does not take into account my basal metabolic rate (which is imprecisely about 2,200 calories for my height and weight at zero activity level. If I were really to just eat what I had "burned", I'd have a daily deficit of 2,200 calories, which comes out to 15,400 calories a week. I'd lose 4.4 pounds each week at that rate, and at least half of that would be lean muscle mass, which would ultimately make my MBR lower. This is why I do not let myself go that low. Generally speaking, I become so irritable at that level of deficit that I have to eat, so at this point, it's not been something I can maintain in any meaningful way. Still, by doing this process, just by tracking the calories I "burn" with keeping track of the calories I consume, and being aware of how much of each I am doing, the net results after 15 full days is that I have dropped 12.5 pounds! Some of that is water weight, some of it is redistribution, some of it is lean muscle addition (and perhaps a little bit of muscle subtraction), but a fair chunk of it is also body fat, and that is something I'm happy to see go "bye bye"). My point with a lot of this is not to say that pacer is cool, or that calorie counting helps, or that evaluating my BMR on a regular basis is helpful (though all of those are). The act of a self check-in, to see what exactly I am doing, and being mindful of that check-in, helps me keep my motivation. It helps me to recognize if I am on track, or if I need to modify my plan. Additionally, it lets me consider if the time I am spending is the best use of my time, or if I can somehow modify what I am doing. Ultimately, what I choose to do with that time, (especially with walking) is important, because it is now literally time I cannot do something else. Actually, that's not entirely true, I'm using that time to listen to CodeNewbie podcasts (currently up to Episode #33), so there is a very limited level of multi-tasking I can do ;). How about you? Are you giving yourself a regular check in? This may seem like a borderline macabre post, but it was prompted by my recent deep dive into the CodeNewbie podcast. Episode #17 featured Scott Hanselman (a great episode about engaging with new programmers or anyone in tech) and one of the comments that he made was the idea that we all have a limited amount of keystrokes left in each of us. Scott breaks it down like this. Think of how old you are now. Now consider a conservative life span. For me, to date, the direct line of males in my family have lived to 82 at the latest, though my Dad is looking great at 75 and shows no signs of slowing down yet, so that's a plus :). I'll take a mid figure and say 78. that means I have about thirty years of words left in me. Divide that by the number of hours I work in a given day, and then divide that by the minutes in those hours, and then divide that by the number of words I type, and there you have it. The point to this is that we have a lot of things we can do, but often we end up doing things that are repetitive and can possibly be of benefit to others if we do them the right way. In other words, instead of answering emails with the same questions, writing blog posts and pointing people to them might prove to be of more benefit. I was reminded of this a week or so ago as I realized that on any given week, a big portion of my traffic comes from the series of posts I wrote four years ago when I embarked on "Learn Ruby the Hard Way". My rationale was that I was already looking at this stuff, and experimenting with it. I wanted to take notes and see if I could explain what worked and what didn't. If it didn't, was it a problem with the material, or was it a problem with me? More times than not, I'd discover it was a problem with me, or my understanding of the material. By talking out the ideas in the blog posts, and rereading them back to myself, often I was able to uncover problems just by talking out the problem, as though someone else was there to listen. Four years later, those experiments, frustrations and discoveries are still bearing fruit. To me this highlights the importance of us documenting our journeys. It's tempting to say that a blog post is just a blog post, and that in the grand scheme of things, doesn't amount to very much. I think the opposite. To borrow again from Scott, by putting a URL to our words, we have the potential of seeing our words outlive us. Granted, the specifics of our posts may ultimately prove to be outdated, but the general process of learning, discovery, and our individual journeys along the way have timeless truths that may well prove to be valuable to other travelers. In the ideals of Will Allen Dromgoole, "I'm building a bridge for them" or at least I hope to. The tl;dr version of this is "find ways of sharing your discoveries, and do what you can to limit the repetition of what you say". If you truly say it once, say it in a chat or an email. If you find yourself referencing it more that that, blog it. You never know what piece of advice you may have hidden in a chat transcript or an email thread that may help hundreds or thousands of others. As a blogger, one of the nice perks that happens from time to time is that people send you items to review. Most of the time, my reviews have centered around books in PDF form or software as downloads. In other words, the item I'm reviewing is not a tangible "thing" but an electronic file(s). Today, I received my first "real thing" to review, and intriguing doesn't even begin to describe this. I have a setup that I use that converts a regular table into a standing desk, using two Ikea Lack end tables. When I want to sit down, I just take the tables and set them to the side, but when the standing desk configuration is in place, well, I typically stand up and do my thing. Often that also involves shifting around, putting my foot up on an upturned wastebasket, and changing positions. With my desk in the seated setup, I sometimes break out a yoga ball to use as a chair, the consistent shifting back and forth giving my core some movement and some variation. I've often lamented that I didn't have something similar for a standing desk configuration. "What, dare say, is the FluidStance Level?" you might ask. 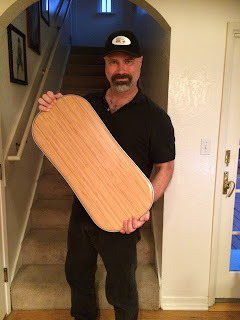 To put it simply, it's a balance board that you stand on while you are at your standing desk. This is the top sheet, made of bamboo. It's sturdy and smooth, plus it looks like a nice piece of furniture. The underside of the board looks like this. 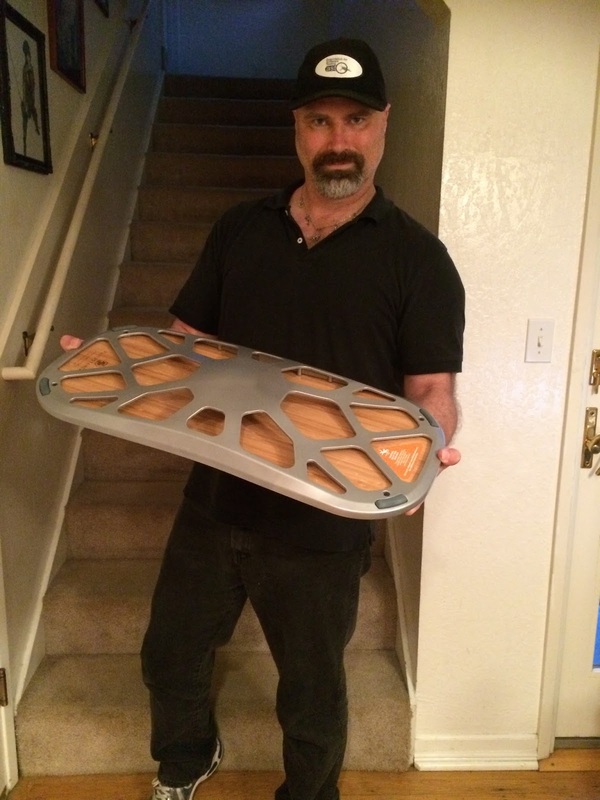 The base is made from aluminum with a powder coat finish. It's very smooth and the curve of the base creates a moderate imbalance while you stand, but doesn't feel dangerously so. First impressions while standing on it is that the balance point feels natural. At shoulder width stance, it feels a little like standing on a small boat out on the water. With a narrower stance, you work a bit harder to keep the balance, but it doesn't feel at all clumsy or unpredictable. Instead, it gives a gentle swaying motion with consistent feedback to help you right your stance and keep balanced. All well and good, I hear you saying, but what is the point to this thing? 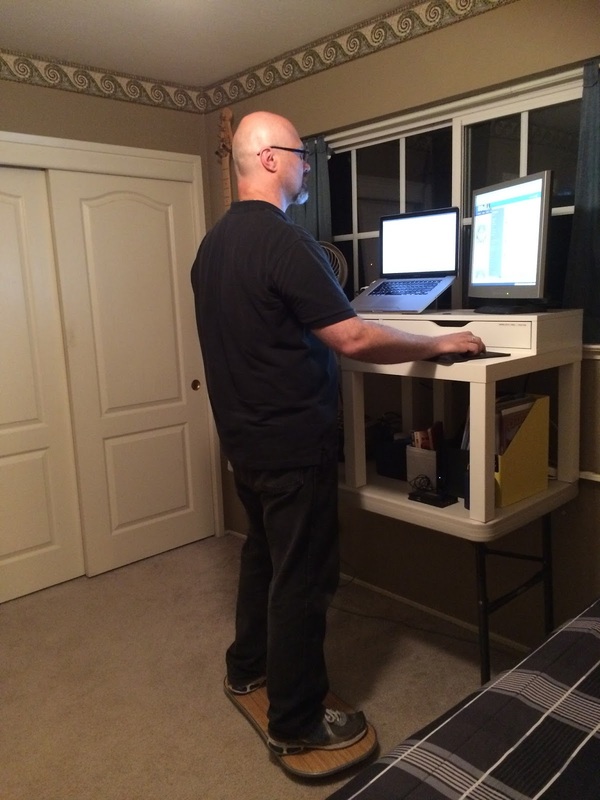 Put simply, while you are at your standing desk, you stand on the board. The consistent shifting of balance and readjusting gives your body something to do while you are working. I decided to see what thirty minutes of working would be like with The Level, and I found it to be surprisingly fluid and, dare I say it, natural. 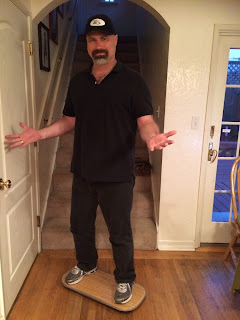 As you stand on the Level, you are definitely "active", which means that you are going to probably need to step away from the desk a little more often, but what I did not feel was fatigued or sore. In fact, it felt the opposite. I found myself feeling very relaxed, even with the shifting weight. Of course, the standing desk to balance myself against also helps. So what's my verdict on the FluidStance Level? I personally enjoy the sense of shifting movement. I liken it very much to sitting on yoga ball if you have a sitting arrangement set up. It's surprisingly comfortable, and it's easy to get the hang of the sweet spot to balance with little effort. There's something nice about having a product that you did not even know existed come into your reality and have you say "wow, I've waited years for this!" but of course you didn't because you had no idea such a device even existed. I'm looking forward to using this balance board in the years to come. Today's post has a local flavor, and it's something I've been mulling over since I got back from the CAST conference in Grand Rapids. Conferences are often expensive, they require travel, time commitment off work and away from family, and a need to negotiate flights, hotels, transportation, etc. These are indeed headaches, but the return on that hassle is often great interactions, learning new things and getting answers to questions I have from sources I might not have initially considered. Plus, I managed to make a new set of great friends each time I go. For the past few years, we have also had a Saturday event happen before CAST, which has gone by a couple of different names (Test Retreat, Test Coach Camp, etc.) and this has been a much smaller affair. The costs are nominal, usually just enough to cover rental of a space and some snack foods during the day (attendees are encouraged to get breakfast before arriving and go as small groups for lunch). What I find great about the process is the model used for facilitation. Test Retreat/Test Coach Camp is run as an "un-conference"or an Open Space Conference. The topics are voted for democratically, and those people who want to be part of a particular topic participate, and those who don't, don't. Some sessions may have nearly all of the attendees, and some sessions may have two or three people. In both cases that is perfect, because the person speaking is sharing their experience and the people in need of hearing that message get to do so. One of the challenges I have faced with being one of the leaders of the Bay Area Software Testers meetup is that we want to encourage more people to speak, but there are often limits to opportunities for those potential speakers to get in that space. We have done lightning talks and we are embarking on quarterly Lean Coffee events, but my personal goal is to do something that will help encourage more software testers, and in particular those in the Bay Area to come together, develop talks, practice speaking, conduct workshops, and engage with the broader testing community that's right here. This is why I'm proposing that we do our own Open Space Conference, the Bay Area Software Testers Un-Conference (BASTUC) . One day, one place, and as many software testers as want to participate. Agenda? You set it! Topics? You decide! Speakers? In this case, I encourage everyone who would attend to come with at least one topic they would like to talk about, even if it's formative or just to say "I have so many thoughts going on in my head about THIS THING, and if I don't get together with some other people and discuss it, my head's going to explode!" Well, OK, we hope not literally, but we want to encourage testers to feel comfortable coming out and discussing the things that matter to them. Chances are, they matter to other people too. For the record, I have not told Josh and Curtis about this. This is a blind side, and frankly, it's just an idea. I want to see if there would be support for it, and who would participate. If you want to play along, please leave a reply, and we'll take the next steps if this is something that appeals to enough people (and seriously, in my mind, if we get ten people interested, that's enough to move forward on this). Also, the name is open to discussion, but I had to call it something ;). Yes, I am late to the game on this, but this really deserves to be a destination for people learning to code, who want to learn how to code, or may even just have an itch in their brain that they might want to code in the future. On any given day, I match all three of those ;). That's why my discovery of CodeNewbie has been fun and informative. First, some background. CodeNewbie describes themselves as "the most supportive community of programmers and people learning to code". There is a lot of great content on their site, such as Ruby Monday where each week they get together to work on a project, and yes, all are welcome to participate if they want to. 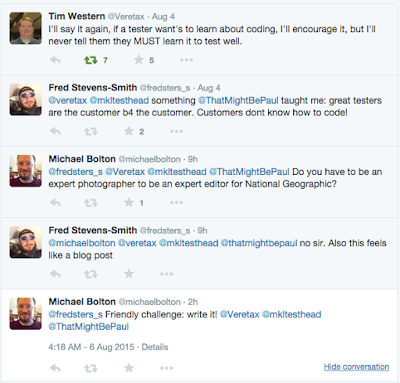 Each Wednesday at 9 p.m. EST they host a Twitter chat, using the #CodeNewbie hash tag. I've followed along with a few of these, and they are quite informative and, while primarily focused on the new programmer, don't be surprised if you don't learn a thing or two even if you are experienced in programming. All this is great, but it's the podcast that I want to focus on. The CodeNewbie Podcast has been around since September of 2014, and it is hosted by Saron Yitbarek. I first heard Saron on the Ruby Rogues podcast, and some time back I made a note to check out the CodeNewbies project she had announced at the time. Like many things, it fell to the back of my list, but as I kept seeing CodeNewbies pop up in my listings, I decided I had to give it another look, and specifically, yes, the podcast. Since they now have 49 episodes, I'm approaching them in alternating order, meaning I am listening to the earliest episodes, followed by the latest episodes, and simultaneously working my way forwards and backwards. What that has done is let me see just how dramatically the show has improved in delivery (this is to be expected with any regular podcast) but also how consistent it has been in staying on message and in a format that is both accessible and readily relatable. Saron gets a lot of credit for that, in that each show is structured in a similar manner (yes, comparisons to Ruby Rogues abound, but since that is one of my all time favorite technical podcasts, that's meant to serve as praise). Saron also has a voice designed for radio, and considering she spent some time at NPR interviewing people, that should surprise no one. It adds a polish and an ease to the episodes that makes each interview feel smooth and well presented. That's not a requirement for podcasts, since I generally prefer practitioners over over-coached pros, but when you can get both, hey, run with it! If you were to listen to any one episode, I would encourage starting at the beginning, with Saron's interview with Carlos Lazo titled "Bootcamps, Water Coolers, and Hiring Devs". Carlos talks about his time in the "Flatiron School", which is a programming bootcamp. The interview covers a lot of ground, such as the difference between studying computer science and actually being an engineer, why he chose to attend a three-month bootcamp to become a web developer, and several interview related questions and strategies for would be developers to consider. One piece of advice I really liked was to "own your ignorance". Don't be intimidated by the fact that you don't know something. In fact, embrace the idea that, if you are asked about something you don't know, you will not fake your way through an answer. Instead, reply with "I'm not familiar with that particular area. Could you tell me a bit more about it? How do you use it?" Seriously, this interaction alone is worth the time to listen to this episode, but there is so much more to glean from it, so I encourage you to do so. If you are new to code, have dabbled in code, or have made a decision to get more involved with code, then CodeNewbies is a great destination site. Saron's podcast is a great way to plug in, get inspired, and learn about many aspects of the world of coding you might not think relate to it, but are as essential as the syntax you learn. TESTHEAD gives the CodeNewbie podcast two thumbs way up :). As I have come back from CAST, and I have taken some time to settle back into daily life and breathe a little easier, it strikes me that there's some stuff happening in my local reality that I'd like to encourage others to get involved with. If you are outside of the San Francisco Bay Area, this may not be all that interesting to you. If you call the Bay Area home, and specifically, if the cities of Palo Alto or San Francisco are easy for you to get to, then these two items may be of interest to you :). Socialtext was acquired a few years ago and folded into another company called PeopleFluent. While we do have a site and a brand that is advertised as Socialtext, all of our hiring is being done through PeopleFluent. After being alerted to the fact that that was causing some confusion, I figured a quick explanation would help matters. If you go to the Socialtext web site and look at the Senior Quality Engineer position, and then click on "Apply Now", you will be directed to a job listing with PeopleClick. That is by design and exactly what you should see. Also, while I cannot guarantee it will fast track you in the system, you have the option of including a note that says you are an employee referral. If you'd like to contact me directly and have any questions, I'll be happy to answer them as best I can. After that, if you add that you are an employee referral, and say that Michael Larsen referred you, we'll both be telling the truth ;). Bay Area Software Testers was originally created with 1 rule: it won't always be Curtis, Michael, or Josh speaking. Unfortunately, for the most part we've violated that rule. It's time for that to change. Join us for the first of our quarterly "Lean Beer" BAST events. What is Lean Beer you ask? Well, it's identical to Lean Coffee, but we used beer (or water) and it happens in the evening instead of the mornings! "Lean Coffee is a structured, but agenda-less meeting. Participants gather, build an agenda, and begin talking. Conversations are directed and productive because the agenda for the meeting was democratically generated." The basic idea is we talk about what the majority of the people present want to talk about. There is no central speaker and no central topic. Come prepared to talk about what matters to you! We are also planning on using these events to help get an idea of what people are interested in, and trying to find experts to come and speak on those topics. So come, discuss, and have fun. My goal coming back from CAST was to get more involved in the things happening locally, and emphasizing my commitment to software testing in the Bay Area. Consider this a first step towards that :). During the week that I was at CAST in Grand Rapids, there were many changes in my personal life that occurred, and that I am having to process and work through now. this is not going to be about testing per se, but if I don't find a place to get this out, it's going to eat away at me, so I'm going to do it here. I'm also likely to get emotional here. I've commented that sometimes, we need to have navel gazing posts on our blogs from time to time, and this is one of those days. Nine years ago, shortly after my son's tenth birthday, we decided it was time to have a pet join our family. My wife and I had kept animals like fish and birds for our entire marriage, but we hadn't had a dog or a cat, partly because we wanted our children to be old enough to appreciate them and interact properly with them. Our neighbors across the street had several Welsh Pembroke corgis, and of course my kids adored them. When it came time to have a dog, we knew they'd want a corgi, so we asked our neighbor who we might talk to. She told us of a corgi faire that was happening down in Los Gatos, CA, and that several breeders would be there showing their dogs. As we went and talked with people, we met a lady that had brought several dogs to show, including one that she felt wasn't really into the whole "dog show" thing. She believed this particular dog would benefit from being part of a family. Our kids met the dog in question, a sweet fawn colored girl that was a little over a year old, and they fell in love with her. We decided to take her home. My son at the time was playing Final Fantasy X and thought her coloring and her antics reminded him of one of the characters from that game, so he named her "Rikku". About two months ago, we noticed that Rikku was moving more slowly, seemed to be breathing heavier, and was generally listless and not her usual self. as we were petting and scratching her, we noticed that around her neck and her hip joints, she had swelling and big bumps. We had the vet take a look at her, and our worst fears were realized. She had stage four lymphoma, i.e. cancer of the lymph nodes. we enquired about treatment options, but soon realized that her condition was terminal. It could be a year at the furthest, several weeks at the shortest. They gave us some medicine that they said could help her feel better in the short term, i.e. a cortico-steroid, but that it wasn't a cure. It would just be a matter of time before the cancer progressed further. For several weeks, we gave her the steroid drug, and for a time she rallied. Her lymph nodes shrank considerably, and she was, in many ways, her old self. She was playful, happy, went with us to her favorite places, and interacted with us as she always had. Unfortunately, last week, the slow movements and heavy breathing came back again, and when we checked, her lymph nodes were even more swollen than before. I had to leave for Grand Rapids, but I asked the family to keep me informed as to her condition. By Monday, August 3, her mouth was gaping open at the sides. She couldn't close her mouth, her breathing had become ragged and harsh, and she wasn't walking well. She didn't look like herself, she didn't act like herself, and I was told that they felt that the time had come, and that we needed to have her put to sleep. They felt horrible that I wasn't there, but they felt waiting until I came back was going to prolong the inevitable and force her to deal with several more days of pain. I told them that they did not need to wait for me, that I understood what needed to be done, and that at this time, Rikku needed us to say goodbye and let her suffering end. 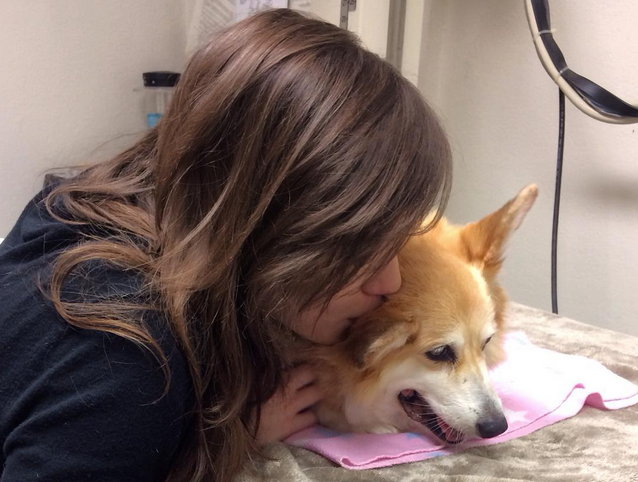 My wife and elder daughter brought her into our veterinarians office on Tuesday, August 4, and they said their last goodbyes to our little girl. Since I was dealing with the conference and all the activities that went along with that, I was kept busy and had limited time to think or process what had happened. In some ways, I felt bad that I wasn't able to be there with my family in this moment of grief and sadness, but I encouraged from afar and did my best to let them know I loved them and felt every bit the same way they did. 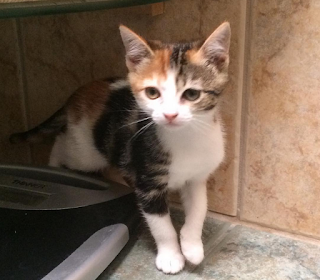 It would be another few hours until I got home, but once I arrived, I went into our little hallway bathroom (the place we have for the time being set up for the kitten's home) and got to know her. As I held her and listened to her purr like a small motorcycle, I cried a little for the loss of a longtime member of our family, but smiled a little in that this little patchy furball was already helping my girls come to grips with the loss of Rikku. This morning, as we were talking about the new member of our family, I made it clear that that is exactly what she was. She was not a "replacement" for Rikku, she was an animal with feelings and the ability to love and be loved in return, and that she required the same level of love and commitment that had been given to Rikku all these years. While I was waiting to get on the plane, I participated via chat in the "naming game" for this little kitty, and by the time I had gotten home, no suitable name had yet been agreed to. This morning, though, that was resolved. We all agreed that her name would be "Éclair", because she looks like one with her chocolate and golden and white patches. As I sit here today, walking around my home, listening for the barks and tell-tale scrabbling along the wooden floor that I would normally hear, it is clear that my little girl is gone. Rikku brought so much joy to my family, and I am missing her greatly. At the same time, Éclair is purring and meowing and nestling into my arms when I pick her up, and that brings a smile to my face. When I asked Christina what made her decide to get the kitten, she said it had been the eerie silence of the past two nights, the absence of the familiar noises and interactions with Rikku. She said the thought of dealing with that going forward was just too painful, and while part of her feels that having Éclair helps to act as a distraction to that empty silence, she is also warming up to her as well. If you have read this far, I thank you. There really isn't a point to this other than I feel the need to talk about it and share this part of my reality at this time. As I was away for an entire week, I'm just now processing my emotions surrounding all of this. The one thing for sure is that time marches on, and changes will occur, whether we want them to or not. Life happens when you are busy making other plans, and sometimes, it has no regard for the things you had planned originally. Still, we have a chance to make new choices every day, and some of those choices can be profound. All we can do is live them and deal with the changes that come our way. Ever have an experience at a conference that just sticks with you, that one thing that seems like such a little thing and then, as you consider it more and more, you just slap your forehead and say to yourself "for cryin' out loud, why didn't I think of that?!" On Monday while I was at CAST, I was the room helper for Dhanasekar Subramaniam's tutorial about "Using Mind Maps for Mobile Testing". Much of the session was around heuristics for mobile testing and the ability to capture heuristics elegantly inside of mind maps. as part of the process, we spent a bit of time creating mind maps in XMind to use later with our chartered test sessions. I've done this before. I've even created a full mind map of the entire James Bach Heuristic Test Strategy Model (yes, one mind map and yes, when fully expended it is massive. Probably too massive). As we were working to create nodes and sub-nodes, Sekar pointed out that there were many labels that could be applied to the nodes, and that the labels were additive. In other words, each node could have several labels applied to them. As I was looking at this, and seeing labels such as pie chart fill, green check boxes, people silhouettes of several different colors, red x's, green yellow and red explanation points, and many others, I started thinking about how, by color and proximity, we could gauge how much coverage we have given a particular mindmap (or in this case, how completely we have applied a heuristic to testing) and what the results were for that. Instead of stopping to write down lots of notes, each node we were testing would get a label placed, and each label would have a semantic meaning. Green check box meant good, red X would mean failed or something wrong, a quarter pie chart would mean a quarter done, a yellow square would mean something that was a warning, but maybe not an error. Different color people icons would mean the person who performed that set of steps, and so on. As I was looking at this, I joked with Sekar that we could tell the entire testing story for a feature or the way we applied a heuristic to a story in one place with one relatively small map. We both chuckled at that, and went on to do other things. The more I thought about this, though, the more I liked the idea. In a previous company, we set up a machine and had a couple of flat screen monitors attached. These flat screens were placed in the main area and left on, cycling the images that were shown, only in this case, they were graphs and pages of results that were relevant to us. In short, they were acting as information radiators for our team. At a glance, we could know if the build had failed, if deployment was successful or not, and where the issue would be if there was one. We could also use this technique for information radiation. Imagine a charter or set of charters. Each one had their own mind map. Each mind map could be cycled through presentation on the monitor(s). the benefit would be that, at a glance, the team would know how testing was going fort that area, and we could update it all very quickly. I kept experimenting with it, and the more I did, the more I became convinced this just might work. 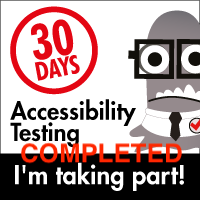 To that end, I am holding a Weekend Testing session this coming Saturday, August 8, 2015 at 10:00 a.m. PDT. We will look at mind mapping in general and XMind in particular, and we will develop a small heuristic for a feature (within XMind itself) to test and to update. I really like this idea, but I want to see if it can be tinkered with, and if it might be a useful approach to others. If you think this might be a fun way to spend a couple of hours, come join us on Skype. Contact "weekendtestersamericas" and add us as a contact. On Saturday, get on Skype about 20 minutes before the session and say you want to be added to the session. Prerequisite, if you want to follow along and actually do the exercise, would be to download the XMind app for your platform. Again, I apologize for the short notice, but I hope to see you Saturday. Jessie Alford told me something that astounded me... he's at Pivotal, working on Cloud Foundry... hey wait a minute, that means he's in my neck of the woods now! Mind you, that has nothing whatsoever to do with his talk which is "Driving Adoption of Chartered Exploratory Testing In An Agile Organization", but it made me smile because I have talked with a n umber of people over the last couple of years about what Cloud Foundry does and how they approach testing... and now I can see it for real :). Pivotal believes in exploratory testing, even if they don't have a dedicated test team. They have dedicated explorers that work in shifts along with their other development responsibilities. they create a variety of charters to help describe areas that might be risky. I am impressed that a programming team would spent the time to develop charters for exploratory testing, but Pivotal has surprised me many times over the years (at my previous job I was a daily user of Pivotal Tracker). Jessie shared his backlog with listed charters, and it's cool to see how targeted they are. Also what's cool is that everyone is encouraged to write charters, and each team develops their own norms as to how they are written. Each of the questions they ask are able to point back to the charters for targeted testing. As Jessie explained, charters are a general purpose scaffold. When Dev teams started looking at charters, they used them for testing, but they also started using them for lots of other things, like how to interact with other components, and use it to make sure that they are working effectively. Another key aspect they learned was that pairing is not enough to communicate skills across an organization, but charters can allow teams to codify those abilities. Additionally, it's not enough to just teach exploratory skills, but to be able to confirm that those skills are transferred. In Pivotal, the term "test" doesn't get used very often in Pivotal, but "Explore" is an every day word. When you say test in a TDD, CI, CD environment, test has become so diffuse that it's lost its meaning, but exploring is easy to communicate, so it gets used. Automated checks are of course used and are important, but the ability to look at exploring makes clear the ways it is used in Pivotal, which is pretty cool. Quick message to Natalie Bennett, Elisabeth Hendrickson and Dave Liebreich... Jessie done good, y'all should be proud of him. Jessie, if you find yourself down in the Pivotal Palo Alto office, let me know so we can get together for lunch or something :). We hear about organizations dealing with change for applications and hardware that are in data centers or in server farms in remote locations, but how about making changes to equipment that resides outside of Earth orbit... or on another planet entirely! Barbara Streiffert gets to deal with that reality as part of the Jet Propulsion Laboratory. She deals with testing of the Mars Rover, among other initiatives. Talk about a risk averse environment! So much of this talk was specific to information shown on video. She showed us details about the Dawn Spacecraft and Ion Propulsion... wow, talk about a unique test experience! How cool would it be to work on systems that control Ion Engines! For those not familiar with what an Ion Thruster is, instead of heating the gas up, xenon is introduced into the gas chamber, and the ionization that results causes thrust (that's what I heard, I will not vouch that I got that right ;) ). Fortunately, this talk was part of webCAST, so everyone can see the videos and details. The Dawn spacecraft flyover of Ceres is being shown, and my inner third grader is totally spazzing out right now :). For those not familiar with the concept of Lean Coffee, a group gathers together (coffee optional), proposes a set of topics, organizes the topics to see if there are synergies, votes on the topics to set the order of discussion, and then goes into discussion of each item for an initial five minutes. If there is still energy for the topic after the first five minutes, we can vote to continue the discussion or stop it and move on to another topic. 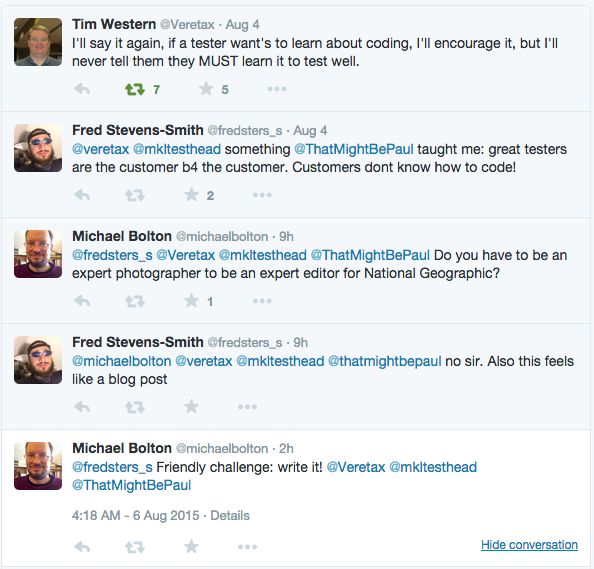 Of all of these ideas, the testing strategy seemed to get the most traction. Everyone seems to think they know what it is, but it's a struggle to articulate it. Regulatory compliance could be a relevant area. What about shadowing a company(s) and see what they are doing with their new testers, especially those who are just starting out? What are their needs? What do they want to learn? What do those companies want to have them learn? Consider it an anthropology experiment. Action was to encourage the attendees to see which companies would be game to be part of the study (anonymized). How Can We Grow Software Testers Through our Local Meetup Groups? Getting topics of interest is always a challenge. How do we focus on areas that are interesting and relevant without being too much the same as what they deal with a work. Albert has been hosting a Resume Club at his Toronto Testers Meetup, and that's been a successful focus. Gaps in experience can help drive those discussions. Lean Coffee format itself can be used in meetups, and the topics discussed can help develop new topics that appear to be of interest to the community. Encourage games and social interaction, we don't necessarily have to focus on talks and discussion. ST Grant program can also be used for this. We offer grant funds for meetup support, but we also have the option of flying in people to meetups to help facilitate events as well (Michael did this in Calgary back in 2012 for the POST peer conference). If monthly meetup is too difficult, commit to quarterly and work to recruit speakers in the in between time. If the critical mass gets large enough, schedule more meetings. Have a round robin discussion from a talk that's already been presented and recorded. Make workshops based on topics of interest. Matt discussed this around a web app that aims to help teach people to program (as part of a Book to Teach People How to Code in Java). In a way, this is a two part problem. On one hand, there's the interface to engage and inform the user to get involved and learn how to code. The second is the meta-elements that can determine if the suer has completed the objective and can suggest what to do. Both require testing, but both have different emphases (the ability for an application to determine if "code is correct" can be challenging, and there is always TiM TOWTDI to consider (There Is More Than One Way To Do It). Good discussions, good ideas to work with, and so many more possible things we didn't even get to consider. Lock and learn for me is that it might be cool to run an anthropology experiment with other companies to see what they want to have their testers learn. Time for breakfast, see you all in a bit :). Erik Brickarp gets the nod for my last session today. After facilitating three talks, it feels nice to just sit and listen :). Erik's talk focuses on "A leap towards Context-Driven Testing". When chaos and discord start raining down on our efforts, sometimes the best break through comes with a break with. In 2012, he joined a new team at a big multinational telecom company. That team had a big, clunky, old school system for both documentation and loads of test cases (probably based on ISO-9001, and oh do I remember those days :p ). What's worse, the teeam was expected to keep using these approaches. To Erik's credit, he decided to see if he could find a way out of that agreement. The team decided they needed to look at the product differently. Rather than just focus on features and functions, he also decided to look at ways that the project could be tested. In the process of trying to consider what the test approach had to be, they moved from multiple spreadsheets to web pages that could allow collaboration. By using colors in tables (as they used previously in cells) they were able to quickly communicate information by color and by comment (reminds me of Dhanesekhar's tutorial yesterday ;)). By stepping away from iron-clad rules and instead focusing on guidelines, they were able to make their testing process work more efficiently. Of course, with changes and modifications, this welcomes criticism. The criticism was not based on the actual work, but they were upset that the junior team member went behind the back of the organization to "change the rules". Fortunately, due to the fact that the work was solid and the information being provided was effective, informative and actionable, they let them continue. 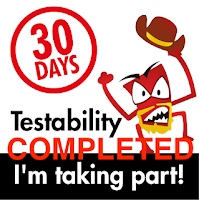 In the following weeks, they managed to make the test teams deliverables slimmer and more meaningful, faster to create and easier to maintain. By using a wiki, they were able to make the information searchable, reports listable, and easy to find. Erik admits that the approach he used was unprofessional, but he was fortunate in the fact that the effort was effective. As a lesson learned, he said that he could have approached this with better communication and could have made these changes without going behind their backs. Nevertheless, they did, and so they have a much more fun story to tell. The takeaway here is that there is a lot of things we can do to improve our test process that don't specifically require corporate sanction. It also shows that we can indeed make changes that could be dramatic and not introduce a ton of risk. Support is important, and making sure the team supports your efforts can help testers (or any team) make transitions, whether they be dramatic or somewhat less so. Additionally, if you have a hope to change from one paradigm to another, it helps a great deal to understand what you are changing to and how you communicate those changes. Additionally, make sure you keep track of what you are doing. Keeping track doesn't mean having to adopt a heavy system, but you do have to keep track. Exploratory testing doesn't mean "random and do anything". It means finding new things, purposefully looking for new areas, and making a map of what you find. When in doubt, take notes. After all that, make sure to take some time to reflect. Think about what is most important, what is less important, and what I should be doing next. Changing the world is important, and if you feel the need to do so, you might want to take a page from Erik's book. I'll leave it to you to decide if it makes sense to do it in full stealth mode or with your company's approval. the latter is more professional, but the former might be a lot more fun ;). We spent the first part of the session framing the problem and encouraging the attendees to discuss the issues, now we are unleashing the hounds and letting them hear what a site sounds like as seen by a screen reader. To be brave, we submitted the AST web site to the #a11y treatment. Needless to say, we have some work to do to behave better with screen readers, but it made for a great way to discuss the challenges. Humanize: be empathetic, understand the emotional components. Unlearn: step away from your default [device-specific] habits. Be able to switch into different habit modes. Model: use personas that help you see, hear and feel the issues. Consider behaviors, pace, mental state and system state. Build: knowledge, testing heuristics, core testing skills, testing infrastructure, credibility. Learn: what are the barriers? How do users Perceive, Understand and Operate? Both the design principles and the HUMBLE heuristic are useful early in the process of discussing Inclusive Design and overall Accessibility coding. What can we do when we are testing an existing feature, and we are evaluating it for Accessibility? We are working on a feature that is Dev Complete and has been delivered for testing. Do we have some suggestions for that situation? As a matter of fact, yes :). Albert encourages testers to embrace "PaSaRaN". the word "pasaran" in Spanish means "They Shall Pass". If you say "no pasaran" you are effectively saying "you shall not pass"... and now my cheesy title should make a little sense ;). It's entirely possible that you can go through your testing career and never get involved in an Accessibility project, but it's a very good bet that issues surrounding Accessibility will affect you at some point in your life, whether it be in a secondary or primary aspect. If you would like to evaluate products for Accessibility, PaSaRaN is a clever short-hand. If you find yourself getting into site design or web development, I'd like to encourage you to consider the ten principles and be HUMBLE in your designing and coding. Also, if you would like to talk about any of the stuff that we covered directly in the workshop, please feel free to contact either Albert or me and we'll be happy to answer any questions. Albert Gareev and I have been working on the material for this presentation for a long time, so I am excited to be facilitating this workshop session. Albert is making his debut as a speaker at CAST, and more important, this conference has been the first time we have met each other in person. We've collaborated online for five years, so to finally get to work together on this material as relates to accessibility means a lot to both of us. The fact that we have a group of people interested in participating with us is icing on the cake :). Accessibility is not just for people with "special needs". Accessibility comes into play for everyone at some point. In the presentation, we presented an example of a person with several "physical impairments" and asked the group to tell us what this person looked like. We had some interesting discussions, and then we revealed the trap, a picture of a young lady looking at her cell phone while walking across the street. After a few chuckles and an explanation, we introduced the idea of "secondary disability" or the fact that there are certain environments where a person has a special need, where in their regular environments they might not. Over time, if we are lucky to live long enough every one of us will deal with a special need that falls into the Accessibility realm. If we have impressed on the group that Accessibility is more than just for people with specific disabilities, I will consider that a huge success. Albert and I both agree that putting a heuristic out there for people to use, while helpful, is much more potent when it is seen in action. A few months ago, I had the chance to give an accessibility talk at STP-CON in San Diego, and as part of my presentation, I asked the participants to fire up a screen reader on their systems and navigate to one of their favorite pages. As the screen reader started to do its job, the reactions were both amusing, and very telling. They "saw" how difficult it was for non-sighted users to "listen" to the information on the screen. They were drowned by the rapid fire speech that was trying to articulate what was on the page. this was one example and one condition. There are many other areas that accessibility covers as well (non-sighted, limited-sight, no-hearing, limited-hearing, limited movement, limited cognitive ability, etc.). Accessibility is a difficult requirement to test for, in the sense that context has to be taken into consideration. Most of the time, we have to pick and choose which Accessible features we will use and who we will address. Is it enough to make a screen reader work with the product? Do we need to also had closed captioning for hearing-impaired? Do we have a way to make shortcuts for limited movement? Are we looking to address all of them at once, or are we willing to take them on one at a time. We're taking a break now, so this seems like a good time to push this out. I'l come back with part two of our workshop in a bit. Eric Reis wrote an interesting book called "The Lean Startup" back in 2011, and it's become quite the buzzword du jour. Thomas Vaniotis has decided that he wants to get beyond the buzzwords and actually discuss Lean Startup and make the case that Lean Startup is all about testing. Thomas recently made the shift from Technical Tester to Product Manager, working with a "Lean Startup" and he states categorically that he is doing as much testing as ever, if not more so. Thomas uses Eric Reis' definition of a startup, which is "a human institution designed to create a product or service within an environment with extreme uncertainty". "Lean" is the idea that we want to focus on the essential value, and remove the waste from the system wherever possible. Put the two concepts together, and you get "Lean Startup". This means that organizations that embrace this are going to look rather different from one another. It also means that what is considered value and what is considered waste will be different in each organization. Testers, this means that context matters a LOT! Waste can vary. Overproduction is a real issue in a literal product factory, but it's also visible in software for features that are not used or have no value. Code needs to be maintained, tests need to be run, refactoring needs to take these empty features into account, and other features that may be more important are not made because the time is being spent working on stuff that is not relevant. Idle machines are a reality in factories, and backlogs in moving features forward is every bit as bad. I see this when we have a number of stories in DevComplete but with no testers with open cycles to work on them. What happens? They sit there until they can be picked up and addressed. Over time, this lag can be significant; getting a feature from PM proposal to shipped can take days, but some times it can take months or even years. In all, identifying waste takes some time and talent to recognize, and it can be a real struggle to eradicate it once it builds up. There's waste in programming, there's waste in design, there's waste in testing,and there's waste in release. It just happens. the goal is not to eliminate it, but it is important to look to see where waste occurs and see what can be minimized. Testing is part of of the waste production and waste prevention culture. It's a solid part of what we do as testers, not just to find problems but to also find inefficiencies that we can work on. How do we do that? We can do that with Validated Learning, which means we subject failure to scrutiny, which in turn opens us up to failure. It's possible our investigation may disprove our hypothesis. Our experiment may show that we are wrong in our assumptions, but learning that also helps us expose and remove waste, even if the waste we remove is faulty assumptions of our own. One of the ways we can help drive the learning is with a "Minimum Viable Product". This is an ideal method for applying what is called the "Build-Measure-Learn" loop. By building the smallest possible product, we can learn if our ideas our sound, if our product meets the need and if the data we receive supports the notion that we are on the right track. testers do this all the time, even with something that's not a MVP. New ideas are spun out from each cycle of this process. If this looks a lot like exploratory testing, indeed, it is :). Thomas used a number of interesting examples (Zappos, Dropbox, etc.) and how they made their minimum viral product. For Dropbox, it was a video explaining why they had a solution for something most people hadn't figured out was even a problem. Additionally, Dropbox did it in a way that everyone could understand... it's a folder. That's it! For most people, that's all they need to know or deal with, and it's proven to be wildly successful. Food on the Table designed their system around initially a single customer. By working specifically with that one customer, they discovered what they needed to do to refine and create the system that would ultimately develop, and with each new family they added, they refined it even more, including automating a lot of the processes. When we make MVP's, we need to measure the effectiveness of our efforts. In short, we need actionable metrics. What is the data telling us about our product, and are we accurately measuring something that is relevant? Does our vanity influence this choice of metrics? It certainly can. Case in point, I love seeing the hits on my blog each day. Yes, I pay attention. The problem is, hits alone tells me very little. It may mean people come to see my page, through some means, but does it mean they read the whole post? Does it mean they liked what they read? Does it mean they shared the link with someone else? Hit count won't tell me any of that, but it sure sounds good to say "hey, I received thousands of hits when I posted this". that's a vanity metric. It feels good, but it doesn't really tell me much, and it certainly doesn't guide me to action. Once you have data that tells you that something isn't working, you need to change. The term for this is "pivot", and pivoting is much harder with large and bulky products. MVP's are easier to pivot with. Additionally, pivoting isn't just doing something different, but it's helping people see a pain point that they don't know about and you are ready to address. In this case, testing can help the organization not just confirm quality, but also see avenues to pivot into as well. Lean Startups are often associated with Continuous Delivery. The reasoning is that, if we can deploy more frequently, releases themselves become much smaller and more manageable. When an organization gets to pushing multiple times in a day, releases can literally be a single story or a single bug fix. The turnaround time, instead of being counted in days or weeks, could be counted in hours, or even minutes. This approach doesn't minimize testing, it exposes it as even more relevant and necessary. While MVP's are a starting point, the fact is, the product needs to mature and quality needs to continually improve. By using the Lean approach, that process becomes easier to manage, because the experiments are smaller and the turnaround time to getting a broken build fixed becomes easier with smaller incremental changes. Regardless, some experiments fail, and the line needs to be stopped at times. Be ready for that. Time to put on my facilitator hat. Thanks, Thomas for a great talk, and now let's see what the audience has to say :).